A skeleton is all that is left of a bass I buried in the garden after filleting it last year. The fresh fillets provided my family with a delicious and nutritious meal. Parts we didn’t eat were returned to the living earth, buried in the rich, dark garden soil. In doing this, I practice a meaningful and necessary ritual that affirms and celebrates life. I thank and honor every fish I catch and keep in this way. 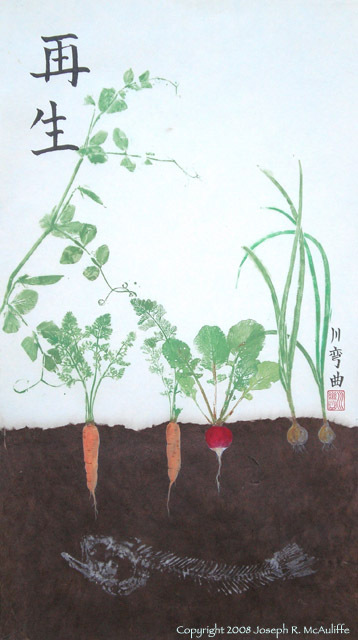 Through nature’s alchemy, the buried, decayed remains are reborn as peas, radishes, carrots and other fresh vegetables. In this way the fish continues to feed us. Bacteria decompose proteins in the carcass, forming ammonia, a chemical consisting of nitrogen and hydrogen. Plants must have nitrogen, but plants cannot use it in the form of ammonia. Other kinds of soil bacteria convert ammonia into usable nitrate. All living things require nitrogen; it is an essential part of amino acids, the basic building blocks of proteins, and of DNA, the molecules that contain the instruction code for assembling those building blocks into complex proteins, cells, tissues, and organs. Three-quarters of the air we breathe is nitrogen gas, yet this form of nitrogen cannot be used by either plants or animals. Nitrogen gas must be converted into other chemical compounds and deposited in the soil in order to support life. Nitrogen from the air is naturally changed into usable nitrogen compounds by certain kinds of bacteria and cyanobacteria (blue-green algae) and also by intense heating of the air by lightning bolts. Nitrogen that has become parts of the bodies of living things is also reused. Wastes eliminated by living animals contain nitrogen compounds that are recycled, and after death, the decomposition of bodies of plants and animals release nitrogen in a form that plants can use. The intensive agriculture required to sustain the earth’s 6. 7 billion human inhabitants rapidly depletes soil nitrogen, requiring inputs of fertilizer. One hundred years ago in 1909, a German chemist named Fritz Haber developed a way to chemically combine nitrogen from the air with hydrogen gas to form ammonia, which could then be processed into nitrogen-containing fertilizer. This development was so important that he was awarded the Nobel Prize in chemistry. Today, Haber’s discovery is used to produce 100 million metric tons of nitrogen fertilizer a year, and is responsible for providing food for a third of humanity. However, the nitrogen fertilizer produced this way is not free. The hydrogen required in the process is costly. It must either be created by using electricity to split apart molecules of water into hydrogen and oxygen gas, or by using a chemical process where methane in natural gas is broken down and hydrogen is released. Currently, using methane is cheaper and requires 3-5% of the world’s annual natural gas production, which amounts to 1-2% of the world’s annual energy supply. Because of this cost, many of the world’s poorest people are unable to acquire commercial fertilizers for their crops and attempt to raise enough to eat in severely nitrogen-depleted soils. Multitudes are severely malnourished as a result. That is why I bury the remains of the fish I catch in the soil of my garden. Rather than squander Nature’s nitrogen treasure, I recycle it. To thoughtlessly throw the unused parts into the garbage, to be buried deep within a landfill, would be a crime against Nature, which includes all of humanity. My garden’s dark, moist soil is part of Mother Nature’s womb where new life is created and nurtured. As I pick the plump, ripe peas and pull the sweet carrots, I am privileged to serve as Mother Nature’s midwife during a miraculous rebirthing. This composition was created using the inked impression of a real fish skeleton and the green leaves and stems of vegetables from my garden. The carrots, radishes and onions underground were painted by hand. The two characters read saisei (Japanese) or zaisheng (Mandarin Chinese) and mean rebirth or reincarnation.